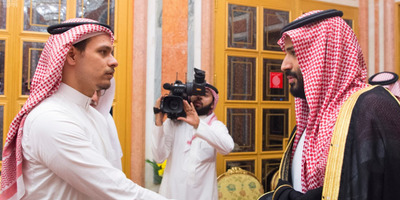 SPACrown Prince Mohammad bin Salman met Jamal Khashoggi’s son in Riyadh. Saudi state media on Tuesday published photos of Jamal Khashoggi’s son Salah Khashoggi with Saudi Arabia’s King Salman and Crown Prince Mohammed bin Salman. The kingdom has acknowledged Jamal Khashoggi’s death but claimed it was a result of a fistfight during a “rogue operation” in the Saudi Consulate in Istanbul. Prince Mohammed is widely suspected of orchestrating Khashoggi’s killing. Jamal Khashoggi’s editor at The Washington Post said Saudi Arabia had barred the journalist’s children from leaving the country. 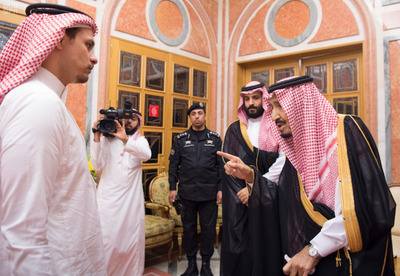 Jamal Khashoggi’s son was pictured on Tuesday with Saudi Arabia’s King Salman and Crown Prince Mohammad bin Salman, who is widely suspected of orchestrating the journalist’s killing. The state-run Saudi Press Agency reported that Salah Khashoggi met the king and crown prince in Riyadh. Riyadh has acknowledged that Jamal Khashoggi died at the Saudi Consulate in Istanbul this month, but it claimed it was the result of a physical altercation gone wrong and was a “rogue operation” unknown to the Saudi leadership. Turkish President Recep Tayyip Erdogan on Tuesday pushed back on those claims, describing Khashoggi’s death as a preplanned murder by Saudi agents. SPAKhashoggi’s family members were pictured with Prince Mohammad and King Salman. Sahel Khashoggi, another family member, was also at the photo op on Tuesday, the Saudi Press Agency reported. The journalist, a Saudi national who was a US resident, had four adult children, all of whom were educated in the US, NPR reported. Karen Attiah, Jamal Khashoggi’s editor at The Washington Post, expressed concern about his family, saying Saudi Arabia had barred his children from travelling out of the country to put pressure on him for his writing. “Days ago, the family said that they are still ‘yearn[ing] to be together,'” she tweeted earlier this week. She added that Salah Khashoggi and two of his siblings are dual US citizens. The White House did not respond to Business Insider’s request for comment about Salah Khashoggi’s citizenship. While he was alive, Jamal #Khashoggi told me what saddened him the most was the fact Saudi Arabia imposed travel bans on his kids after he started writing for @WashingtonPost. Prince Mohammed also called Salah Khashoggi to express his condolences, the Saudi Press Agency said on Monday. Jamal Khashoggi’s fiancée, Hatice Cengiz, was also placed under 24-hour police protection by Turkish authorities earlier this week. It was not clear whether she is still under protection.